Thanks to the generosity of the St. Louis CVC my family spent 2 1/2 days in a city I probably wouldn’t have ever thought to visit. And now… We anticipate our next trip! I was, honestly, amazed at all St. Louis had to offer- and much of the great stuff is free! I am always amazed when I visit a city with majestic landmarks that the “natives” can be so nonchalant about them. 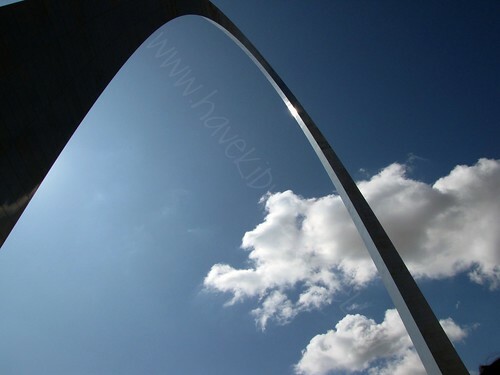 I suppose it comes from viewing them continuously… I was not prepared for the absolute awe the Gateway Arch inspired in me. I could have laid on the grass below it and watched the clouds blow by all day. Nor did I realize that there is an amazing museum below the arch. The free activities around St. Louis are incredible. The St. Louis zoo is absolutely amazing and it sits in the most beautiful parkland. Both the Anheuser-Busch brewery and Grant’s Farm have free admission and the new City Garden is great fun for the family. While we did visit the Magic House we didn’t spend as much time there as the girls would have liked and we didn’t make it to the City Museum. Looks like you all had fun! We try to get to St. Louis every year, but hey – we're Cardinals and Blues fans!